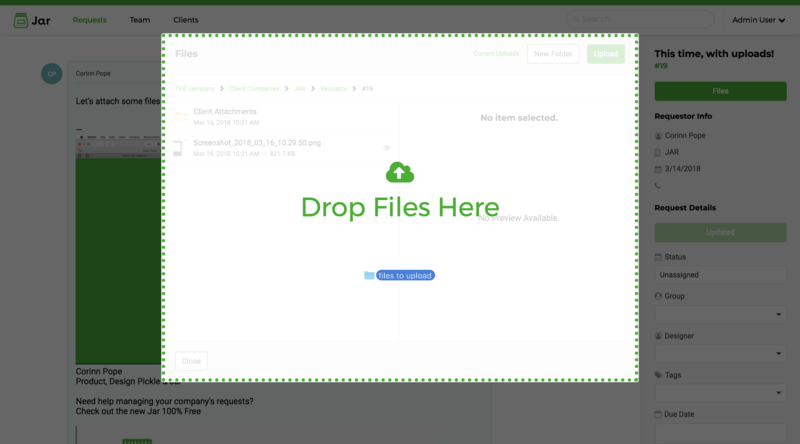 Jar makes it easy to manage, upload, preview, and share files with colleagues and clients. In this article, we're going to go over how Jar stores your files and how to use Jar's features to share, preview, and manage the creative assets of all your requests. 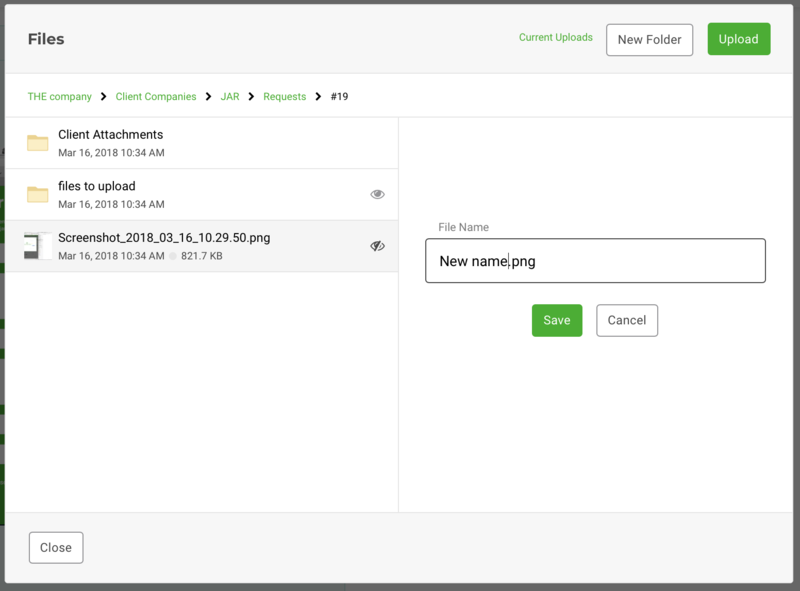 One of the great features of Jar is that folders are automatically created as your client and request list grows. Everything stays organized and exactly where you expect it to be. Here is a sample file structure you'll find when you look at the attachments a client has included in their request. Each client company has their own folder, which is further broken down by requests. A client attachments folder is also generated with every request (regardless of if the client attached anything or not). If you would like to create customer folders, you may add your own folders anywhere within your file manager with the steps outlined below. Creating folders is simple in Jar. Now that you have an empty folder, we need to add some documents to it. On Chrome and Firefox, you can also drag and drop files to upload. Documents may be previewed by navigating to them in the file viewer. The preview pane allows you to see most file types prior to opening them. You can hide files and folders from clients by clicking the eye icon next to a folder. When the icon looks like this your client will be able to see that file or folder in their portal. When the icon looks like this, your client will not be able to see those files or folders. They will be invisible to them in their portal. A quick note about sharing hidden folders: If you try to share hidden files or folders with your clients, they will be unable to see them. Team members will still be able to see hidden files if they are logged in to Jar. Files and folders can also be favorite by clicking on the star shaped icon next to the file or folder. Easily find your favorites by selecting 'favorites only' from the dropdown menu of the file manager. Files and folders can be renamed. To rename a file or folder, select the file or folder in question, then click the pencil icon. This will bring up a text field where you can rename the file or folder. Once you have entered a valid name, click 'Save' to save your changes. Client attachments is a system created folder and cannot be renamed. Need to share a document that you have in your file list? With Jar, it only takes 3 steps to make sure your client gets exactly the right files they need. 2.) Click on the "Copy Public Link" button. That will copy the URL to your clipboard. 3.) You can send that URL to your client by pasting it into any email/text/chat/etc. We like to send it through an email by clicking "reply" in the request details.